(NaturalNews) According to a pair of economists who have recently published a peer-reviewed paper in the American Journal of Agricultural Economics, lying about climate change in order to advance an extremist environmental agenda is a great idea. As reported by Breitbart News, the authors — Assistant Professors of Economics Fuhai Hong and Xiaojian Zhao — accept it as a given that the media and the science establishment routinely exaggerate the issue of climate change. However, unlike the majority of their academic colleagues — who flatly deny that any such problem exists — they go a step further and actively endorse a policy of dishonesty as a way to force through desired policy objectives. It appears that news media and some pro-environmental organizations have the tendency to accentuate or even exaggerate the damage caused by climate change. This article provides a rationale for this tendency by using a modified International Environmental Agreement (IEA) model with asymmetric information. We find that the information manipulation has an instrumental value, as it ex post induces more countries to participate in an IEA, which will eventually enhance global welfare. From the ex ante perspective, however, the impact that manipulating information has on the level of participation in an IEA and on welfare is ambiguous. Using large scale disinformation might work might work for climate deniers. But science works differently. Scientists are always afraid to be proven wrong and therefore are inherently on the conservative side. This paper is nothing more then having fun with numbers and figures. And the benefit to the real world is close to none. I don’t think I know anyone who is in more denial than you are. Did you read the abstract above? They’re not talking about people who are skeptical of GWCCD. They are talking about the news media and pro-environmental organisations. I don’t know how you turn that around and make it about skeptics. Name one instance where climate change skeptics have used “large scale disinformation.” Just one. I took that entirely different. I think the climate change fanatics are the ones that refuse to listen to doubts, or other ideas. As far as I’ve seen it’s a closed subject to them. My way or no way. Plz name them. I want to have a laugh. Remember last year the tabloids and other so called media reported about global cooling because of an increase in the Arctic ice cap of 29%? And all this was concluded on the basis of one year. Cherry picking at it’s finest. Where were they the year before when we had an all time record Arctic melt? And I predict all those media won’t report about this years melt either. This sort of media is very one sided and has no desire to report the full truth. It’s like it has an agenda of it’s own. So let me get this right. Denying that global cooling is a thing isn’t cherry-picking? So as long as you acknowledge all science that supports global warming and deny all science that refutes it, then you’re not a cherry-picker? Honestly, it seems the only people who are deniers and cherry-pickers are people such as yourself. Deleted by me because I read Travis’ remark all wrong and thought it said what it didn’t say. Sorry Travis, I have re-read what you wrote and I must say I must have skimmed through it the first time and you got a knee-jerk reaction for what my addled brain thought you wrote. Now that I’ve read it carefully I realize that I got a little backwards there. Ok, I got it completely backwards. Sorry. I thought you were saying deniers were cherry pickers. Doh! I gave you an answer and all you can say is what melt? The one up North of course. The way this blog works is if you want to reply to a certain person’s comment, you click the reply button below that person’s comment. If you just start writing in the box at the bottom, and hit submit comment you are not replying to a particular person but are creating a new comment for the posted story. This is why I did not recognize your reply as a response to my question because it was not submitted as a reply to me, but as a fresh comment to the story. So now I understand that you are saying that the story about global cooling was the example of large scale disinformation from skeptics that I asked for. So what was the disinformation exactly? Was there not an increase of 29% in the ice cap? Did the BBC not report in 2007 that global warming would leave the Arctic ice-free in summer by 2013? Did not an unbroken ice sheet more than half the size of Europe stretch from the Canadian islands to Russia’s northern shores? And was there not more that 20 yachts that planned to sail the open NW passage get stuck in the ice? Was all of that disinformation? This is not a good example of large scale disinformation. Try again. Let me refresh your mind what the trash media wrote. As you can see they will report on an increase of Arctic sea ice. Some even go so far to call it global cooling. But did they also report on the record melt of 2012? Did this blog report about that? I don’t think you know what disinformation is. I have to go to work right now but later I will give you some examples of real disinformation. To be honest I don’t need your examples. Just respond to what I said thanks. No, no, I think you do. Just because you disagree with something does not make it disinformation or misinformation, and I think you need to be educated. Unfortunately I have too many things going on at this point to really get into it, but as soon as I have some time to devote to it I will get into that more. What exactly do you think is disinformation in those articles? I read all three of them and the only thing in any of them which is even slightly misleading is the headlines that say Global Cooling. There are no false statements in any of them, and each article you list up there does mention the record low of 2012. As far as stories posted here on this blog about the record low ice extent of 2012? I don’t know. Maybe it was, maybe it wasn’t. Dan might know. I do remember making some comments about it but stories, I don’t remember. Of course that only matters to people who are frantically looking for an excuse to not believe anything else that might counter what they think. Hmmm, let’s see, who might I be talking about there? Now. Disinformation is the deliberate dissemination of false information. Misinformation is dissemination of false information but not done deliberately so. A good example is Al Gore’s An Inconvenient Truth. There were 11 falsehoods identified by the British courts. Now it is debatable if these falsehoods were deliberate or not. I think they were. So in my mind An Inconvenient Truth is a tome of disinformation. But some people believe that he was just mistaken. Which would make it misinformation. But I don’t believe that for a second. So there you have it. The above examples of “mass disinformation” you cited are not disinformation or misinformation because none of it is falsified. They are supported by reality and facts. Let me reiterate, just because you disagree with something does not make it disinformation. You’re totally missing my point. But that’s what I expected you would do. Disinformation also means one sided information, not giving the whole picture. You could also call it cherry picking information. It’s a bit disappointing you’re not even trying to understand this. No, that is omission. Disinformation is the purposeful dissemination of things that are not true. Misinformation is the unwitting dissemination of things that are not true. What you are talking about is omission. To omit is to leave out or not mention. I think it is hilarious that you try to turn this around on me, to make it seem as if I don’t understand what you are saying. When it is you that doesn’t understand the meaning of the words you’re using. Omission can be intentional, but it can also be unintentional. It is very hard to attribute intent to something that is omitted. As to not getting your point, you are mistaken on two fronts. One that I didn’t understand what you were trying to point out. And two, that you have a valid point to make because what you claimed to be information that was omitted from those stories, i.e. the record melt of 2012, was in fact mentioned in all of the stories you posted. No wonder you are so wrong on this issue. You can not even use a dictionary. We live in an era when conservatives and the financial elite collapse public concerns into private interests, define people largely as consumers and consider everyone potential terrorists. Moreover, the apostles of neoliberal capitalism militarize and commodify the entire society, consider youth as nothing more than a source of profit, define education as training, undermine the welfare state in favor of a warfare state and define democracy as synonymous with the language of capital. We live in a period that the late Gil Scott-Heron once called “winter in America.” As the forces of authoritarianism sweep over every major US institution, the time for widespread resistance and radical democratic change has never been so urgent. Such change will not come unless the call for political and economic change is matched by a change in subjectivity, consciousness and the desire for a better world. This is, in part, a theoretical challenge and supports individual and collective efforts to reconfigure those public spheres where theory can emerge and be refined into modes of critique, understanding and collective action. Nice job of plagiarism. What would Henry A. Giroux think of that? called cut and paste… OMG! ! What do you think of the statement ?- that’s the point, not some lame accusation, as if I was trying to lay claim to it or something like that. But go ahead and ignore the wisdom and challenge of the statement. It reads like a Marxist wrote it and I disagree. I suggest that if you cannot come up with original thought that you at least give credit to your idols. It is ridiculous to trust in the integrity of a scientific “community” where prominent members of academic and government institutions announce they are willing to lie for the supposed good of the peasants. The models are complex, Dr. Mann won’t release his data, and manipulations of peer-reviewed, published graphs to “hide the decline” are explained as unfortunate limitations of space. The warmists have no credibiility, meaning that there is no reason to believe anything they say which is not supported in transparent detail. They are revolutionaries, not scientists. It is a fascinating development when people admit that they’re willing to lie for their cause. The global warming scare is political, not scientific. It represents an old political ploy. When you scare the sheep, they are more willing to be sheared. There can be no discussion with liars. It is worse when the liars claim the status of learned, dispationate science, and then tell you that your peasant mind should just believe, because you can never match the facts to their “models”. You are not allowed to question their models because they were never designed to be questioned. It does not surprise me that an average person cannot directly evaluate the claims and models. It amazes me that the average person can’t tell when they are being lied to, even when the liars say it right out and have the wool clippers (tax schemes) in their hands. Andrew, thanks for that. I agree with you. I almost didn’t approve this post due to its length though. I did edit a little. I didn’t take anything out but I did take out a lot of spaces. Next time please try to be brief. As they say, brevity is the soul of wit! Exactly, no matter what the scientist says they are going to be denied because at the end is a question of billions of Dollars… a lot of people is getting high profit of this “disinformation”. They don’t even know on geological periods… and now we are in a cooling era… the temperature data from the last 50 years taken by the Nasa, etc… shows clearly that there’s no relation with the human intervention on the climate change… but of course in NY city the temperature has risen, but in West Point?? I agree with all you say, except for one thing. I think I have to try to reach people who do not understand, and try to explain it to them. That is why I am here. That is the whole point of posting what I think, otherwise I would not bother to even be here at all. I know I may not be persuading anyone, but I have to try. I would consider myself a complete success if I could get one of these poor misguided fools to actually think that there might be a possibility that they are wrong, and to accept that the sources they trust can’t be trusted to be honest with them. Of course the polar ice is melting. It’s summer. 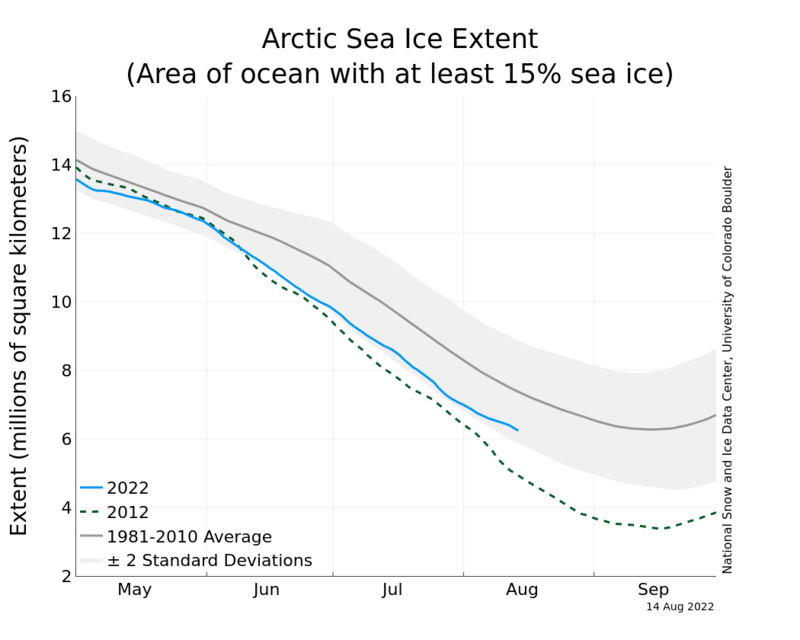 Over 80% of Arctic sea ice melts every summer and reappears every winter. There is an undeniable intentional scam to promote climate hysteria and thereby open the door for authoritarian control at the global level. It’s a sort of power grab by the nations who used to dominate the world by financial manipulation but now find themselves broke. If they want to preserve any sort of dominance it will have to involve military might, and that requires some sort of justification. The general idea is that the planet is in danger so all nations must be brought under the strict control of some sort of central authority. (theirs of course). Even if there were some degree of global warming occurring (which really there isn’t) CO2 would not be the culprit. Among greenhouse gasses, CO2 is neither the most active nor the most abundant. CO2’s influence on the climate pales in comparison to that of water vapor and methane. But even the combined effect of all greenhouse gasses combined don’t drive the global climate. They never have. The sun does all the driving. Water vapor, methane, and CO2 percolate out of the ocean and land when there is more solar radiation. So there will always be correlation between rising temperatures and the presence of greenhouse gasses. But the sun is always the cause and the greenhouse gasses are always the effect. With their sort of inverted logic, the scammers would have us believe that garden snails cause rainstorms. Central authority. Sounds like the UN to me. It all started with the UN. I have always said the UN is pretty much made up of a bunch of countries that hate the US. Well, I don’t believe in anthropological global warming (i believe is a natural cyclic phenomena), but in this case, I support politicians lying to people about anthropological global warming. Pollution is still bad. Talking about increasing possibility to get cancer is less scary than talking about disasters that may occur because of warming, and people, believing to stop global warming will be more responsible. That is just about the stupidest thing I’ve ever heard! Words mean things, except to you I guess. “Anthropological” is the scientific study of humans. The word you want is “anthropogenic” which means being caused by, or as a result of human activity. So your understanding of the subject matter is fundamentally flawed. Now you say you don’t believe in global warming but you still think it is a good idea for politicians to lie about it because pollution is bad? Well if CO2 does not cause global warming, how is CO2 pollution? There is no logic in your reasoning. Yet you are all for lying to people to force them to behave more responsible? Responsible towards what? I think you have drank the koolaid, just not all in one big gulp. Even if you’ve just taken little sips along the way, I think you’ve drank a whole cup! Another thing. Scientific study does not exist to control society, nor is there any place for dishonesty in the pursuit of facts. It is a bastardization of the scientific method and no good can come from it. Even if the stated goal is achieved people will not take it well when they find out they’ve been lied to. And that could have a giant backlash that could set the goal farther back than it is now. If you can’t achieve your goals honestly then your goals have had no merit to begin with. In other words, if your goal is worth obtaining, it should be worth obtaining it honestly. The sun has been declining since 1960, plz try again. The Sun has been doing what since 1960? Perhaps you should try again? You seem to have omitted what it was doing before 1960. Hmm, who was just crying about cherry picking? Global warming scam is known as the Carbon Disclosure Project — cap and trade. It began in 2000 and is run out of London, England. Its last estimated worth is $87 trillion dollars. Remember the burden of proof is on those who claim that man is solely responsible for catastrophic climate change, well because your story came first. It is too bad that the powers that be use the EPA primarily as a means to discourage completion by closing down industry and then giving waivers to political supporters. Instead of preventing injury to people from the environment take take Diablo Nuke Plant for instance. Want is the EPA doing to protect the people who are being inflicted with radiation poisoning? Can you name one person who has radiation poisoning from Diablo? If you believe the plant is vulnerable to tsunami’s and earthquakes that is a valid concern. But don’t go making stuff up. If you can document cases of radiation poisoning from there, fine. If you can’t, don’t go there. The push (what there is of it) for alternative fuels/energy is in no way misguided nor premature. If any “benevolent” lying or manipulation of the masses is occurring, it is at the behest of the powers that be, due to the absolute necessity for a global power to have relatively cheap and constant access to oil. As the access become more limited it behooves the USA (and the world) to use less of it for domestic purposes leaving more for the military and its reserves. That is why we invaded Iraq, and also why we’ve interfered in the middle east since the 1940’s. And why we spend billions asserting our presence there to this day. Also to avoid/delay the huge economic crash that would/will occur unless of course we remedy that by developing alternative fuels/energy. Of course dramatic climate change/warming will negate any and all human endeavors causing global panic and chaos. Again reinforcing the need for an over-powering military force capable of maintaining or gaining control at that point. Your link to YouTube didn’t work for me. At least I tried. I told you I was going to start deleting posts like this. I wasn’t kidding. Stick to the topic or find another blog to post your political rants. This site is for global warming and global warming related issues. I know we get sidetracked occasionally but this post has nothing at all to do with global warming. The next one will be deleted. Consider yourself warned. I have no idea what you are talking about. Global warming is indeed a political issue, but that does not mean that anything political is related to it. If you can tie it in to global warming, do it, post it. If not then don’t post it here, or it’s going to get the chopper. Then delete you’re own posts. Ranting about redheads in topics that have nothing to do with that is useless as well. But I think you were just trying to avoid the topic then. was going to cause redheads to become extinct. How is that not related to global warming? It’s right in the headline. Tell you what, if you can point out what the following has to do with global warming or related issues I will concede your point. “The representative structures of contemporary democracies are under attack on two opposite fronts. One front finds its motivation in a desire to resist the effects that increasing economic inequalities are having on the distribution of political power, effects that are taking contemporary societies further and further away from the ideal of political equality. This is a proposal to cure the diseased state of democracy by making contemporary democracies more genuinely democratic. The other front proposes to “cure” democracy by making contemporary democracies less democratic. The proposal is to replace elected bodies with an efficient technocracy. Because of the distribution of real power in contemporary societies, this technocracy cannot be anything but an oligarchy-controlled technocracy, which would inevitably exacerbate the concentration of political power that the anti-oligarchic attacks on electoral-representative structures are trying to oppose.”-copied and pasted by RNH in a previous post. BTW the you tube link was just a coo coo clock going “coo coo”. And the reason I say that is because you insist that we invaded Iraq for the oil. And that just is coo coo. If that were the case then why aren’t we getting more than 4% of our imports from Iraq now? We get more oil imported from Canada than any other single source. And that’s been true since before the war began. Or I should say before Saddam Hussein invaded Kuwait. This is why I want things to stay on topic with global warming because they can degenerate into arguments over politics very easily. You’ve got a bad memory Neilio. Must be wonderful. Let me refresh it for you. You made the comment about redheads in the article previous to that of the redhead article, and I’ll quote. Or are you going to deny that as well? Ok, you got me. I did post it. I did not, however, go through the process of doing it up as a main post. Dan did that. I would not classify someone posting something in passing like that as a “rant”. A rant is something said bombastically, or said in a manner to invoke anger. That was neither. Plus, it says “climate change” in the link! How is that not related to global warming? So, yes I did “post” it, per se, but I meant I didn’t headline the article with its own topic post. So what? Moving on. Oh, and you still have not pointed out what RNH posted has to do with global warming. I’m still waiting for that. Or are you still jumping up and down over the fact that I said I didn’t post something that I actually did post? Albeit in a comment on a different post. Being a guest poster here you have to understand that there is a difference between a comment and a post for me. When I say I didn’t post something it means I didn’t make it a posting in the main blog. It does not mean that I didn’t “post” it in a comment. That may be a distinction without a difference to you, but a comment and a post mean different things to me. So touche! You win! You got me. I was wrong, from your point of view. Why so little topics on this blog lately? There has been some hot climate news lately. For instance. It might make this blog more balanced and not so one sided. I don’t know. Slate? Are they a peer-reviewed journal? I was curious so I did a search for this story, and I didn’t find too many sources for it. Slate being one. AP is the other. I ask myself; why isn’t this story out in force? I should be seeing all kinds of sources if it was as important as it sounds on the strength of its headline, right? Well, I think I know why its it’s not. You can see why not here. Haha, since when does data collection need to be peer reviewed? By the way, there’s nothing in your link of interest. Sorry, I thought you wouldn’t look at anything unless it was peer-reviewed. Was this data reviewed for quality, and accuracy? I don’t know. Do you? And as far as there being nothing of interest in my link. I think that confirms what I suspected all along. You are a closed minded partisan cherry picker who won’t even consider anything that might remotely challenge your beliefs. And I could easily compare you to a spoiled rotten, ignorant, arrogant, child. Why are you butting in here, defending your disciple? Did you guys meet at an occupy rally somewhere? Two peas in a pod you two are. You’re not so smart to think that. What does that even mean? Are you trying to be clever? Whimsical? Sarcastic? What?